If a flesh-eating bacteria suddenly began killing Denverites, city officials would do everything in their power to stop it. It would be non-negotiable. It’s past time elected officials like Mayor Michael Hancock and City Council members, as well as city department heads, dealt seriously with an actual public health crisis: traffic deaths and serious injuries. That’s according to Leah Shahum, director of the Vision Zero Network, a nonprofit that helps cities embark on their stated goal of ending deaths and serious injuries caused by roads built to facilitate fast driving. The Hancock administration brought her to Denver to inform its Vision Zero “action plan,” still in development more than a year after the mayor committed to the goal. People killed while trying to walk, bike, and drive — 61 last year locally and more than 40,000 people nationwide — are victims of this system. The death toll constitutes a public health crisis, Shahum told a room full of people at the Vision Zero Summit on Wednesday. Acting on that crisis will require concrete changes, not just talk, from Hancock. Many of those changes will have to include retrofitting streets to slow drivers down — “road diets” that may reduce driving lanes to make room for sidewalks and bike lanes, for example. Hancock “needs to be ready for the push back, and needs to be ready when everything does not work perfectly as planned,” Shahum said. Denver should also focus on transportation equity to drive change on Denver’s streets, Shahum said. 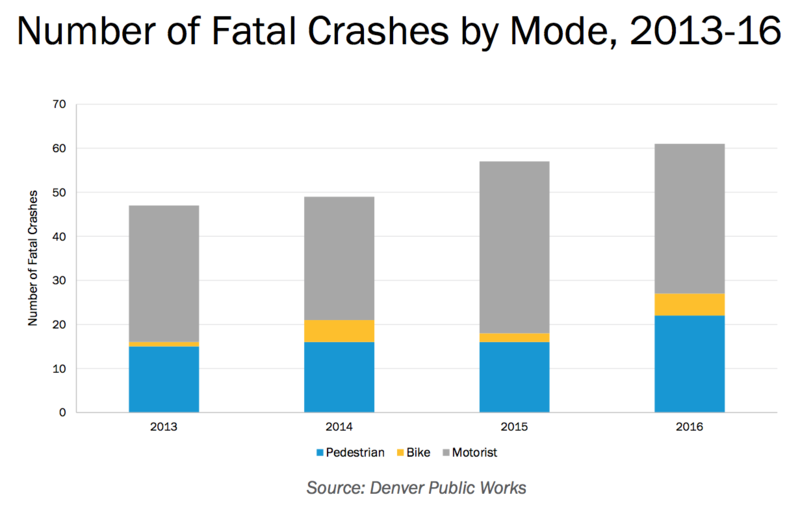 It’s no coincidence that streets in Denver’s poorer neighborhoods like Sun Valley and Valverde are also some of the most dangerous streets in the city for walking, biking, and driving. The city’s Vision Zero plan will account for equity, an official from the Department of Environmental Health said. Something Hancock has yet to do? Set a timeline for achieving his stated vision of zero traffic deaths and serious injuries. This is a standard and crucial piece of any Vision Zero plan, Shahum told the crowd, though the mayor was not around to hear it. He had arrived at the summit late, made a quick speech, then left.